Why Purchase a Baby Monitor? A baby monitor consists of two major components; a transmitter in the child’s nursery or bedroom and a receiver in the presence of the parent or caregiver. Depending upon the type of monitor — audio only, video/audio, movement or a combination of all three — it sends to the caregiver information about baby’s actions and the surrounding environment. The first monitor, the “Radio Nurse,” debuted in 1937, but fifty years passed before baby monitors became a ubiquitous feature in the home. In the 1980s baby monitors utilized analog technology to transmit radio waves, much like an FM radio. However, consumers soon noticed that the signal could be degraded by “cordless” telephones (another mainstay of the 1980s) using the same radio frequency for data transmission. 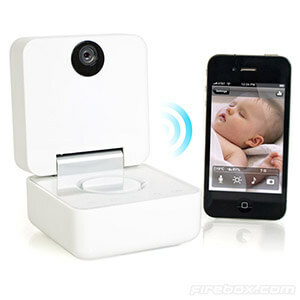 Moreover, other nearby baby monitors and even police scanners could capture the signal, raising concerns about privacy. Newer generation analog monitors search multiple frequencies to find an open band for cleaner transmission between scanner and receiver. While more recent analog monitors reduce signal interference found in older models, any device tuned into the same frequency can surreptiously monitor transmission. 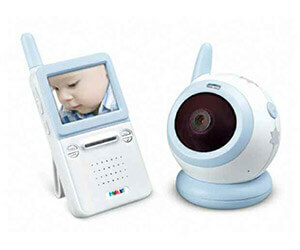 Nowadays, most baby monitors use digital technology to transmit information. Frequency-hopping spread spectrum (FHSS), used by cell phones, encrypts the signal so that only the transmitter and receiver recognize the data sequence. Not only does this system minimize static “scratchiness” and interference commonly found in analog monitors, it helps secure the signal from capture by unauthorized observers. The latest and greatest models combine all three types of baby monitors into one product with the addition of a host of advanced features. Such amenities as infrared night vision, two-way “talkback” between baby and caregiver, a selection of lullabies, and pan/tilt/zoom (PTZ) cameras are just a few of the features now available. Other highly sought features include environmental monitors such as a thermometer and hygrometer, VOX (voice activation with adjustable sensitivity) to automatically turn on the monitor when it goes into standby and multi-camera transmission to monitor(s) with split-screen capability. The trendiest features are Wi-Fi and smartphone apps that allow a parent to observe a baby from across town or country and store images to the cloud, memory card or a computer’s hard drive for posterity’s sake. Note that a smartphone app eliminates the need for a dedicated receiver. With the use of Voice Over Internet Protocol (VOIP) technology, parents away from home can chat with their children or baby sitter. Parents should remember that monitors are susceptible to the same communication outages as cell phones and other internet devices. Choosing a particular model that’s best suited for parents’ needs can be problematic as there are a vast number of monitors available. 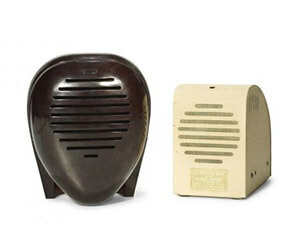 To find the most popular products at the best price, visit amazon.com to see their best sellers. As of 2019, Infant Optics, VTech, Motorola, Foscam, Summer Infant, Levana, Snuza and Angelcare all had products listed in the top 5 of best selling baby monitors. Peruse product specifications and customer reviews to find what’s best for you and your baby. Baby monitors conveniently provide assurance to parents and caregivers about the safety and well-being of their infants and small children. The latest technology offers unsurpassed flexibility and mobility in keeping parents connected to their children, regardless of distance. Monitors give a baby an extra level of security while affording parents more leisure time. Most caregivers find them to be indispensable tools for their busy and demanding lifestyles.